With the variety of health problems we've lived through over the years, it's just regular practice for me to keep my ears open for new things that might help us stay well. It's not that health is the end all goal...I know that our bodies are temporary, that it's our souls that will live on forever. And that's the most important part of me that I invest in. But I also want to be a good steward of the body God gave me here and now, so that I can live well for Him here on this earth. As with everything, it's a always a matter of balance - nourishing all parts of me: body, mind, spirit and soul. Yesterday, Claire and I tried out something new as an investment in our bodies. 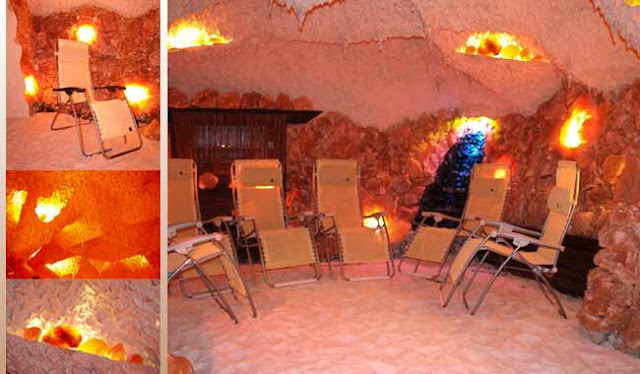 Ever heard of a salt cave? No, I hadn't either until a few years ago, though they've been around Eastern Europe for a long time. Salt caves were first used medicinally after a Polish doctor noted in 1832 that salt miners rarely suffered from respiratory diseases. One theory is that salt's antiseptic properties help fight bacteria. I've read many websites that say it's supposed to be good for all sorts of health problems: respiratory aliments, allergies, digestive problems, heart disease..so far we're "check" on all of those! So off we went to try it out. 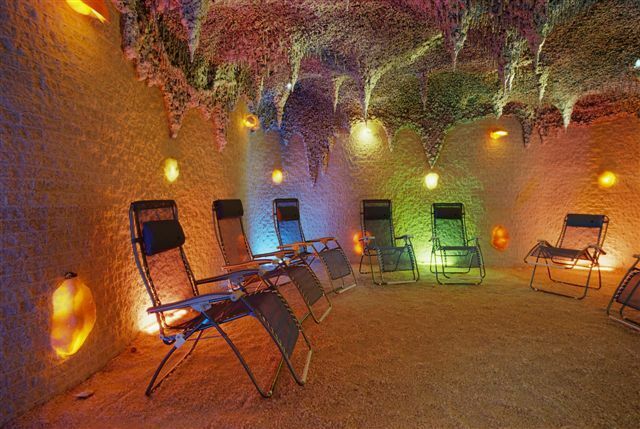 If nothing else, it turns out to be very relaxing in the salt cave! The light is dim, you walk in over crunchy white salt on the ground, surrounded by huge crystals of salt on the walls. Lying in super comfy chairs, you listen to soft music with a soothing waterfall running in the corner. There are blankets to cover up with (it's not that it's necessarily cold in there...but it's not warm either so the blanket was welcome) as you lay there for 45 minutes letting the salt and minerals soak in (I guess!). They say to get the full benefit of the salt treatment, you have to go regularly - once a week if you're well, twice to even three times a week when you're sick (though I wondered how I'd feel being in the salt cave with a really ill person!). With it costing just $3 a session, Claire and I are going to try it out for a few weeks and see if it helps our bodies feel any better. For many years I have suffered from chronic rhinitis (lovely name huh?!) - in common language that's a perpetual runny nose. I have tried so many different medications and treatments for this, none of which has solved the problem. So I'm going to give this a try and see if it helps. I heard one person say a session in the salt cave is worth a week at the sea. While I'd rather be in Croatia breathing in the salt air there, this is the next best thing right now! If it turns out to be of help, I'll write an update and let you what the result was. Where is the salt cave you visited? It sounds relaxing! That's so cool!! I wanna go. is that the salt cave in harcovka? i was there once... it really is relaxing. i hope it works for you!